I walk for all those who can’t and for those who can’t speak and for those who before long will find out their loved one has been diagnosed with Alzheimer’s disease and I especially WALK for one beautiful woman in particular, my mom Doris May. In May 2014, my sweet mama was officially diagnosed with Alzheimer’s. My 6 sisters and 2 brothers and my father we didn’t know what to do, how to help or where to go for help and it seemed as though the professionals didn’t know how to help much either. And so we just did the best we could with not having much knowledge on the disease we continued to press on. February of 2015 my precious mama was admitted to the hospital and from that point forward I began a journey to educate myself as much as I possibly could on ALZHEIMERS. By May I became a huge #GOPURPLE advocate and was posting information and statistics on the disease on social media. In early May, I went home to visit my mom who had now been transferred to an assisted living memory care home and spent the hardest week of my life as she was cognizant enough to know she wasn’t home but not capable of doing or remembering much of anything else and begged me day after day to take her home. My heart broke for this sweet woman and how helpless we all felt. So hopeless because it seems no one really knows the best way to treat and help a combative Alzheimer’s patient and the only answer it seemed was drug induced complacency. Not a good answer at all. Upon returning home I began my #GOPURPLE campaign and one day was astounded by a fact I found. That currently 5 million Americans suffer from this disease… 5 million families were suffering as we were suffering. Slowly watching our loved ones minds, abilities and even personalities be robbed by this life sucking horrific disease. What a tragedy, an epidemic, 5 million people’s and family’s hearts and homes have been devastated by this disease. 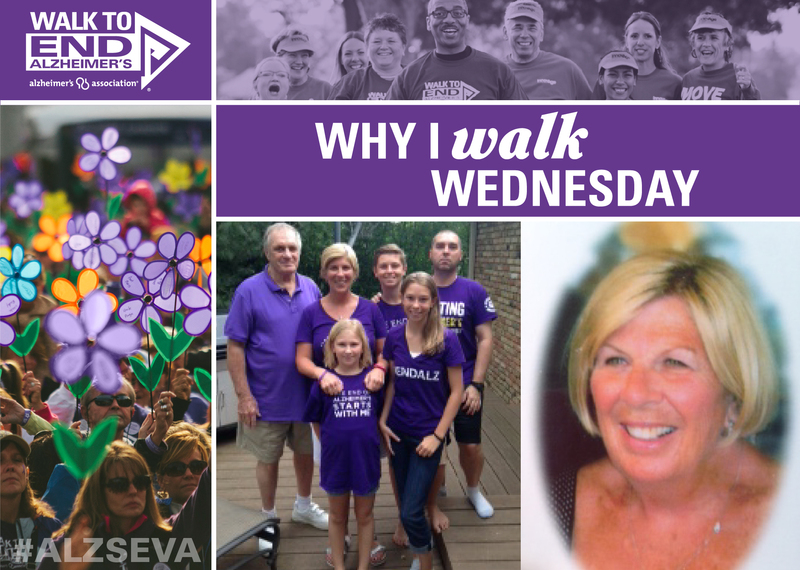 5 million know exactly what we were experiencing and this knowledge became a huge burden to me and has propelled my fight, walk and pledge to #ENDALZ. On June 20, 2015, my mom’s journey with Alzheimer’s disease ended and she was taken to be with the Lord. And I am so thankful she is no longer tormented and she is at peace. Alzheimer’s stole my sweet mom before she even passed and it is stealing so many loved ones! The disease infuriates me and the more knowledge I gain the more I am burdened. This disease has become my enemy and I have decided/pledged to wage war against it– To walk, to raise awareness, to donate and to petition a cure, educate and offer support to those who find themselves scratching their head right alongside doctors not knowing really what to do . None of this will bring my sweet mama back but it will keep her glorious memory going and it is my prayer and hope to raise awareness, to get people thinking about the projected numbers of those who will be suffering from Alzheimer’s disease and with all my heart, I Walk to #ENDALZ.